The members of South Jersey Collaborative Divorce Professionals serve the New Jersey counties of Burlington, Camden, Gloucester, Salem, Atlantic, Cumberland and Cape May. Members include experienced family law attorneys and mediators, and neutral financial and mental health professionals who have assisted clients in a variety of contested and uncontested formats. Members also include advisors who provide a variety of services to help with specific tasks relating to the life transition of the divorcing couple. All members have been collaboratively trained and believe that the collaborative law process represents an extraordinary advancement in family dispute resolution. The collaborative attorneys in the group devote a substantial portion of their practice to family law matters. They have evolved from attorneys who may have followed the emotional lead of a distraught client into a contested ‘he said she said’ litigation. They have received training in both mediation and collaborative law. 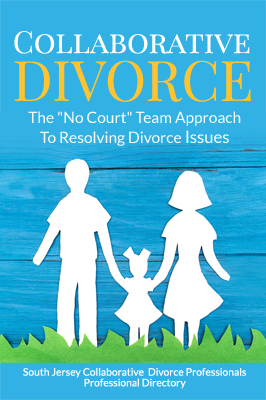 These experienced divorce practitioners realized that there is another way to achieve resolution: one that respects and protects the interests of all family members. The financial professionals are certified public accountants who serve as consultants to the family, and not just to one party. Far from being ‘hired guns’, they are called in to advise the clients and their attorneys as to the financial realities, and help structure the payment of alimony and child support, assist with the distribution of property and advise on the tax consequences. They consult with the collaborative team to see that both parties maximize their financial options, neither at the expense of the other. The mental health professionals are experienced clinical psychotherapists who have helped clients transition through the difficult path of divorce. In collaborative divorce, however, they function not as therapists, but as coaches, guiding the parties across the rough terrain of divorce, keeping understanding on track, keeping emotions in check, assuring a mutually respectful resolution. The advisors assist the collaborative team with various areas of expertise. They are available to help with specific tasks relating to the life transition of the divorcing couple.